The world’s smallest computer fits on a penny with lots of space left over, In fact, it just about fits on the letter N on the back of a penny. The prototype is the smallest in known history and was created to aid glaucoma patients. The chip is based on the phoenix chip which uses unique architecture with ultra low power consumption. 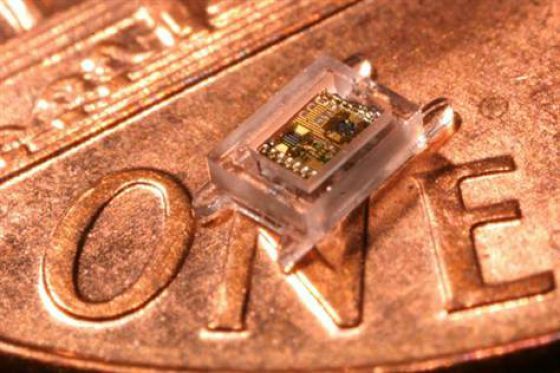 The chip will wake every 15 mins to take measurements of the eye from within. It only uses 5.3 nanowatts on average and the battery will stay charged by exposure to 10 hours of indoor light each day or 1.5 hours of sunlight. The computer package is just over 1 cubic millimeter and includes an ultra low power microprocessor, a pressure sensor, a thin film batter, memory, a solar cell and a wireless radio with an antenna that will transmit data to an external reader device that would be held near the eye. Future uses for the micro minicomputer will include pollution tracking, monitoring structural integrity, surveillance, and make any object smart and traceable. That is a lot of uses for a super tiny computer. Learn Something Fun: In the 1980s, an IBM computer wasn't considered 100 percent compatible unless it could run Microsoft Flight Simulator*.